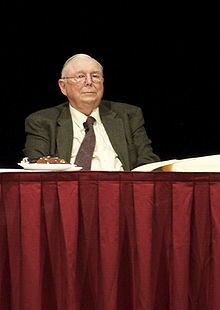 Charles Thomas Munger (born January 1, 1924) is an American investor, businessman and philanthropist. He is vice chairman of Berkshire Hathaway alongside Warren Buffett. He is chairman of Wesco Financial Corporation from 1984 through 2011. He is also chairman of the Daily Journal Corporation and a director of Costco Wholesale Corporation. ↑ Profile, forbes.com; accessed March 13, 2018. This page was last changed on 10 January 2019, at 19:50.